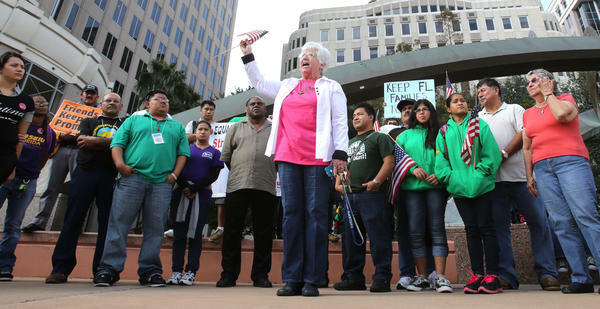 Sister Ann Kendrick (center) of the HOPE Community Center in Apopka, Fla., rallies with Hispanic immigration policy demonstrators from various groups in front of Orlando City Hall in 2012. In 1965, Congress took a major step in addressing the plight of schoolchildren growing up in some of the nation's most impoverished communities: It passed the Elementary and Secondary Education Act. At the time, it was considered an important victory in the "war on poverty." For the children of migrant farmworkers, however, the law has fallen short. Their quality of life and their education have not improved that much, according to the Interstate Migrant Education Council. These kids still drop out at high rates and graduate from high school at low rates — researchers even have a term for it: "mobility-induced educational discontinuity." "The path of migrant workers is paved with poverty, discrimination, racism. All made worse because they are, for the most part, invisible. Migrant farmworkers have the lowest levels of education of any occupational group, according to government figures. Their children often end up like their parents, doing back-breaking work for measly wages." Why is it so hard for these young people to break that cycle? I mean, kids who come to us think they've got a really good job [working in the fields or in a nursery] making $10 an hour, which is what their parents earn. Unless you've got a lot of other income coming into the household, who can live on $10 an hour? Even in this economy here in central Florida, unless you've got specialized skills, you're going to be in the tourism industry even with a college diploma. And those are not high paying jobs. Under federal and state laws, migrant children can legally start picking crops at age 12. And though they're not supposed to work during school hours, many do. Parents turn a blind eye to this because they don't see another alternative. They need the income. For parents with preschoolers, there's usually no day care or anyone to watch over their children, so some of these kids end up in the fields with their parents. Is that a common problem? Yes, sometimes kids wait in the back of pickup trucks, locked in for protection. When I first saw this I thought it was cruel, but it was safer to keep them there with toys and water locked inside with the windows cracked. Most Americans believe that education is the path out of poverty. It's an article of faith that the more educated you are, the less likely you'll end up working for minimum wage. But you say migrant students still face some pretty big obstacles. Social class and racism are still factors. This is what a guidance counselor said to one of our kids not that long ago: "You don't really need a high school diploma because you're Mexican, and you're going to be cleaning hotel rooms or cleaning people's houses. You don't need a high school diploma for that." She said that to her. The kids know that's how a lot of their teachers feel about them. They know it. They feel it. If they were a different ethnicity, if they were a different skin tone, the conversation would be different. The more indigenous looking they are, the more trouble they have. That's how they experience everything they hear. Everything they see is anti-them. It's racism. One young Mexican girl said to me, "Why do they hate us so?" It broke my heart. The Hope Community Center offers migrant families all kinds of help. There are English and citizenship classes for parents, and academic tutoring, help with college and job applications for students. More recently you've provided legal advice for students who qualify for DACA — Deferred Action for Childhood Arrivals. That 5-year-old program is scheduled to end next March unless Congress reauthorizes it. So is the fear of deportation the overriding concern for these kids right now? Yes. We don't have any attorney on staff, but we're doing a thing called Dignity Plan, it's safety planning. They're told to gather certificates, awards and honors from school, proof of participation in the church. Things that show they're educated, that they've done something with their lives. If the worst happens, and you are deported, you can hold your head high and say, "Look at what I did. In spite of racism, in spite of discrimination, in spite of poverty. I'm resilient. I didn't just survive, I made a life that was a good life." We've processed over 500 DACA applications and helped kids get into college. According to the National Center for Education Statistics, the high school dropout rate for this population is as high as 65 percent in some states. A fourth of students drop out before sixth grade. Many migrant kids will remain trapped like their parents in low-wage work with few skills. To call farmworkers "unskilled labor" is ridiculous. It is a very skilled labor. It's dignified work feeding this country. The problem is that the job doesn't pay and the working conditions are bad and the treatment of workers is bad in a lot of places, [though] not all. You can't make a decent living, have some stability, have some benefits, have health insurance, have a retirement plan, dream on, right? The Hope Community Center gets lots of support from the community and local business groups, but you and your staff also get lots of criticism. Some people don't help us because of our politics. Remember, we're in Florida [chuckles], which is not noted for being a progressive state even in terms of its attitude toward Latinos, race or inclusion. How would you describe the most important work you do? We say [to kids]: "We love you. You're smart. Don't give up! Don't let anybody tell you you can't go to college. We'll tutor you. We'll help you get money. We'll even fight your parents if they're giving you a hard time. We do whatever it takes so that you can excel."